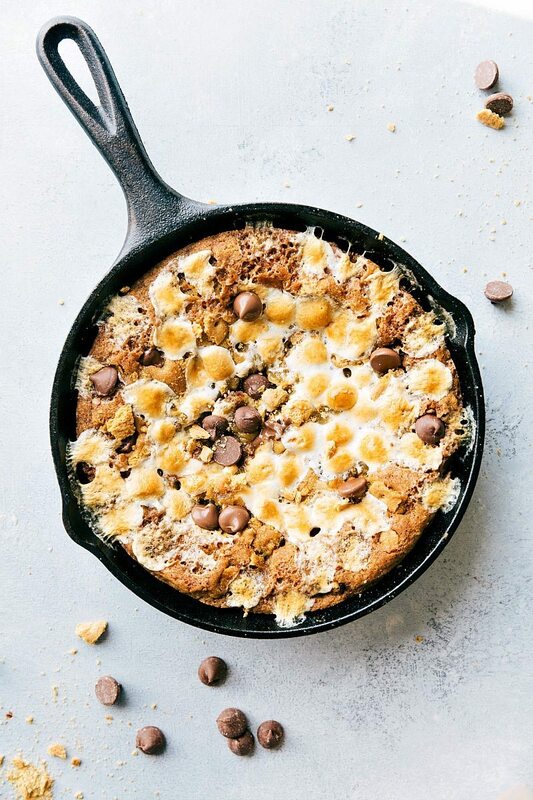 A giant S’mores cookie made in a cast iron skillet. One of our favorite desserts are deep-dish skillet cookies. The flavor you get is amazing and they are so much fun! 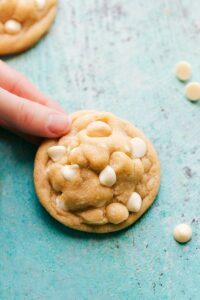 This cookie is made even MORE fun with s’mores flavors — crushed up graham crackers, extra milk chocolate, and melty toasted marshmallows. ? Make sure you use the right sized skillet and follow the measurements closely. The cookie will be slightly under-baked throughout the center which is personally my favorite part. If you are hesitant about the under-baked center, you can cook it longer, but do know that the edges will be likely overdone. Enjoy! 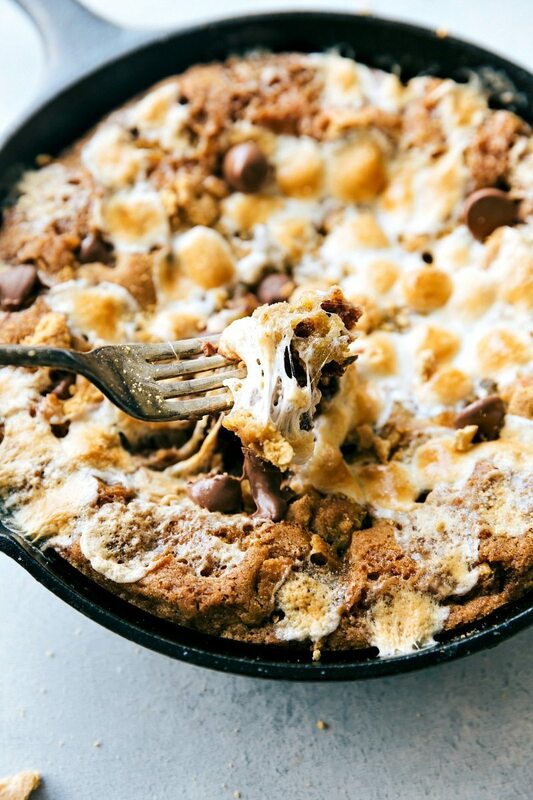 A giant S'mores cookie made in a cast iron skillet. I love seeing s’mores desserts 🙂 They all just look so good! This reminds me of sitting by a fire on a summer night. Ahhh such a happy thought 🙂 love the layers of flavor in this. S’mores are always the way to go! I don’t have a skillet :/ think I’m gonna have to change that because I have seen so many awesome recipes using he a skillet. Plus it’s an essential right? Lasts forever? Thanks for sharing! Pinned! YUM! I can’t wait for warm weather so I can make smores! 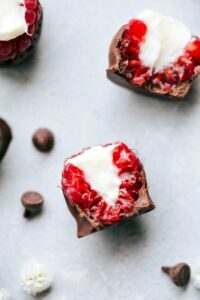 This dessert makes me want them even more! Pinning. You have convinced me that I need to make a skillet dessert! This looks soooo good! I love the toasty marshmallows on top! Girl, you are pulling on my heart strings here! I LOVEEEE smores so naturally I am running to the kitchen to whip this up for my sis-in-laws birthday this evening. Gah…can’t wait to devour! SHUT UP!!!!! 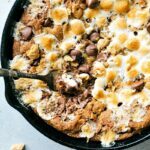 This look sooooo decadent and gooey-I’m dying over that cookie base….and that incredible chocolatey middle…and omg that mound of toasty marshmallows…I LOVE IT ALL! Oh my word this needs to happen in our house immediately! 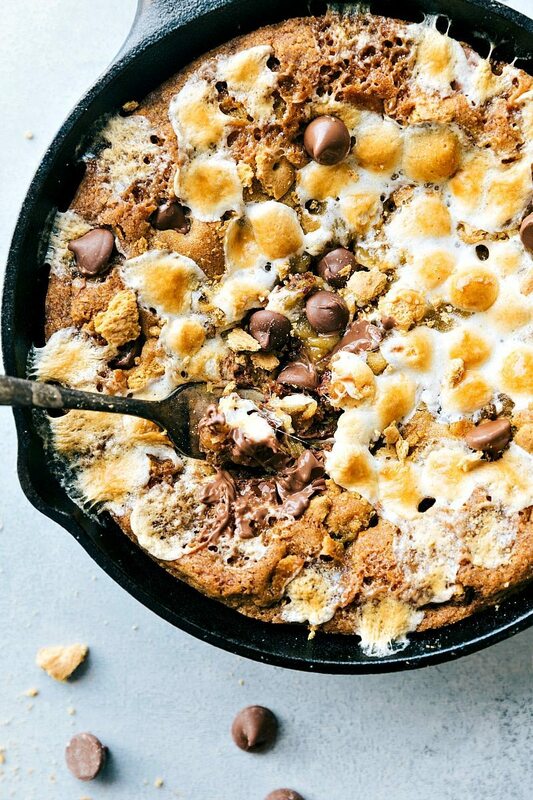 My wife is ridiculously obsessed with all things s’mores and she will go bonkers if I make this for her! Thanks for helping me score some points with the wife! Pinning! Did you see my recent post, Hot Fudge Cake! If you love chocolate, you will die to have this! This looks amazing, loved that you used the cast iron skillet. Oh wow, perfection is the perfect word to describe those delicious looking s’mores Chelsea!! I guess I should use my skillet for more than just hash browns. 😉 Yum! Haha you are so sweet, thank you Lisa!! how in the WORLD did I miss this!??! you have truly outdone yourself again Chelsea, this looks unbelievable!!!! Oh my gosh. I love my skillet too and this recipe is putting it to good use! I am drooling over that picture with a bite taken out of the pie! Yum!! Chelsea, loving the cookie base with the smashed graham crackers.. and oh, the toasted marshmallows!!! Perfection can definitely be the name of this dessert!! I need this in my life soon! 🙂 Pinned! This looks so delicious. I know it must taste divine! Thanks for sharing this at the In and Out of the Kitchen Link Party! Pinned! OMGosh, there is something about chocolate and toasted marshmallow that makes me swoon. Thank you for sharing at Simple Supper.